The sun opens up its eyes and rises from behind the hill, throwing glowing lights on your window. Birds start chirping and so does your alarm. You snooze it and cuddle the blanket tightly. The alarm again rings and you realize you have to wake up. The time is less, so you start doing your morning stuff; have breakfast, grab the door key and step out for your daily work! The story is same with every one of us. The sweet morning sleep is precious and we have to push our body to wake up. But, in this ebb and flow of the morning routine, we forget to freshen up our face and get the feeling of laziness all day long. Am I right, girls? So, just check out some cool tips to freshen up your face in less than 20 minutes in the morning! This the technique was taught to me by my maths teacher in the school. On waking up, fill your mouth with water, close your eyes and splash cold water onto your eyes. It will help to stimulate your eye muscles due to the pressure of the water filled in mouth. The splash of cold water on your face will help to rejuvenate your skin. Another easy trick is to wash your face with lukewarm water. This helps to soothe your skin and also to get rid of dead skin. Amazing morning leads to a better day and who wants to load their face with chemicals first thing in the morning? Just switch your normal morning face wash with a herbal face wash as it has the natural ability to brighten your skin tone and helps get rid of various skin impurities. You can find various herbal face washes in the market; choose the one that suits to your skin type. Vitamin C is very essential for our skin and there is no better source of Vitamin C than citrus fruits. So, just grab some lemon (or any other citrus fruit), squeeze out its juice and add honey. Leave this pack for few minutes all over your face and then rinse it off. This face pack will pamper your skin to the fullest. Indian homes can never be short of malai. You can apply this milk cream in the morning to get soft skin. You can also add a pinch of turmeric to this malai. Regular use of milk cream will effectively reduce blemishes and pimples. Another easy way to freshen up your face is to focus on your lips. Pick up some red fruit, like strawberries and cherry. Crush them to make a paste and apply it on your lips. This easy pack will help to plump up your lips making them soft and rosy. This is one of the easiest tricks and my favorite one too. You can freeze various type of liquid and fruit juices in ice cube trays. 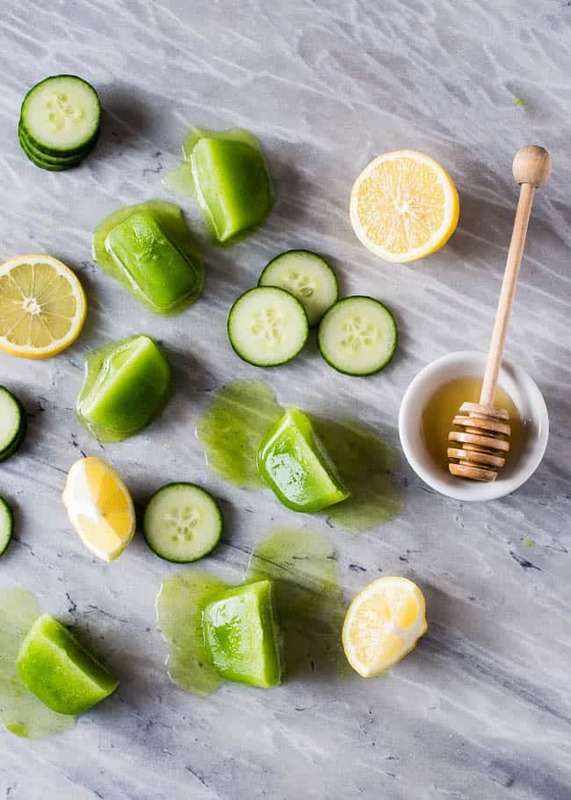 You can use green tea for reducing dark circles, cucumber juice to get fair skin, lemon juice for clear skin, mint juice and coffee ice cubes for glowing skin. You can also freeze aloe vera juice and raw milk to get super soft and fresh skin every morning. Just pick them up from ice trays and roll all over the face. You can witness a glowing face in no time.